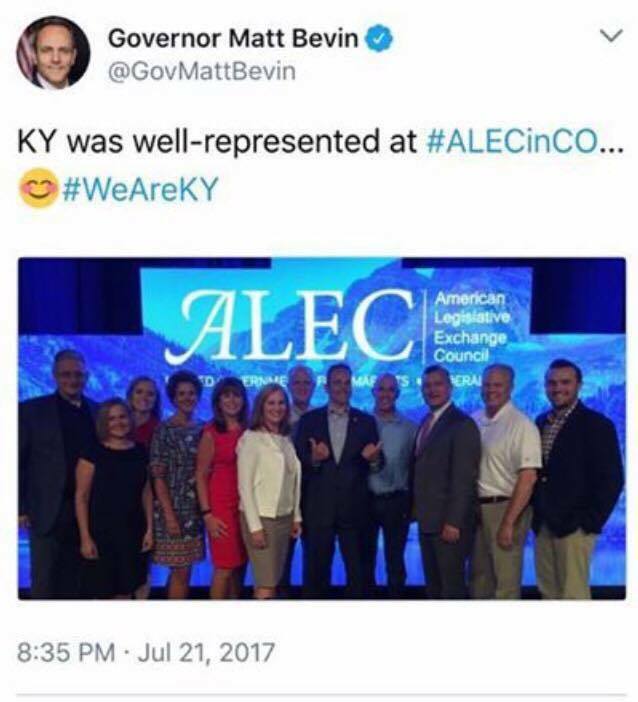 Here we will connect the dots to ALEC and the Koch’s influence in Kentucky, identify those who have clear ties to them, and what we need to do to #UnplugTheKochMachine. 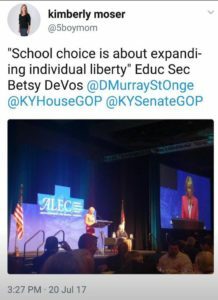 Teachers are out front, taking heat and some credit for being the opposition, but the fact is that this smash-and-grab Bevin/ALEC plan affects every citizen of the Commonwealth. Your DMV, insurance, local and state police, fire, environment, P-12 and higher education are all ripe for exploitation. If we let him, Bevin will carpetbag on to someplace else, perhaps a national office, after he demonstrates his ability and willingness to break the back of the public. 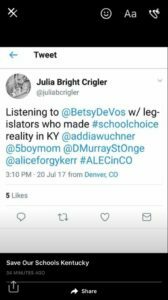 Below are the elected officials who we have identified as having received funding, support or legislation from ALEC and/or the Koch-backed astroturf groups. 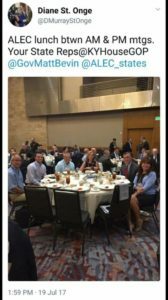 In these Tweets from the ALEC Conference in Colorado last Summer, we see Governor Matt Bevin breaking Koch bread with Alice Forgy Kerr, Addia Wuchner, Mike Wilson, Kim Moser, Diane St Onge, Adam Koening, Jimmy Higdon, Julia Crigler and their “free-market” friends. So you can pretty much assume they’re on the tak-, er, uh, I mean, the list.